In some regards, it doesn’t matter whether the guards were Roman or Temple guards. The mere fact that there were guards represents a real problem for those who wish to dismiss the resurrection. If the tomb had been left unattended throughout the entire time between Jesus’ death and his alleged resurrection, we could posit countless other explanations for the absence of Jesus’ body. (His appearances in a glorified form would still require some explanation, but it is doubtful even that would be taken seriously if there was any question about the disposition of the body of Jesus.) The fact that there were people hostile to Jesus’ followers present and carefully monitoring the situation, however, significantly increases the weight of the resurrection claim–regardless of whether or not they were Jewish temple guards or Roman soldiers. Clearly, though, the more trained these soldiers are, the less likely we can consider other scenarios, such as incompetence. The text is ambiguous in some regards, as already alluded to in the main article. That said, there are several lines of evidence that suggest that there were, in fact, both Roman guards and temple guards. If this can be established, then the presence of Roman guards at the tomb does more than increase the likelihood that the resurrection account is the correct one, it virtually proves it. This is because the Roman guards, besides being exceptionally well trained and demonstrably well disciplined, they are motivated by a huge disincentive: the penalty for incompetence was often death, and all the more when the infractions occur on the ‘night watch.’ One can imagine how little leniency they could expect for managing to lose track of a dead body! 1. In Matthew 28:11-15, the priests and elders pay the guards money to spin a particular story, and in exchange promise that “if this comes to the governor’s ears, we will satisfy him and keep you out of trouble.” It is hard to imagine why the Jewish leaders’ own guards needed to be concerned about what the governor thought. And they had every reason to be concerned, given the particular story they were being paid to tell: falling asleep during a watch was punishable by death, as will be demonstrated shortly. That they guards were concerned about word getting back to the governor shows that they in fact answered to the governor. 2. In Matthew 27:66, we have the Jews hurrying to the tomb and setting a seal. A seal would not have been anything more sophisticated than a bit of string or wax that would allow them to know if the stone had been disturbed. The disturbing of a seal given with the governor’s authority carried the penalty of death. Can we believe that Pilate would have given this authority to the Jews? Surely the seal would have been set by Pilate’s own representatives. The Book of Matthew is a prime source for those inclined to view it as divine Scriptures, but it can be taken simply as a historical source, too. If we are open to other documents of historical value, we find that some other ancient sources address this issue, providing interesting corroboration. 3. The so-called ‘Gospel of Peter‘ was rejected by the Christian Church as apocryphal, which in some minds actually enhances its credibility. Nonetheless, it gives early testimony to what was actually believed in the first centuries after Christianity began to spread. From the ‘Gospel of Peter’ (70-160 AD) we hear explicitly that it was Roman guards that were dispatched; we even learn his name: Petronius. 2 And the elders were afraid and came unto Pilate, begging him and saying, 3 “Give us soldiers that we may guard his tomb for three days, lest his disciples come and steal him away and the people suppose that he is risen from the dead, and do us harm.” 4And Pilate gave them Petronius the centurion with soldiers to watch the tomb. And the elders and scribes came with them unto the tomb. 5 All who were there with the soldiers rolled a great stone to the entrance of the tomb 6 and plastered seven seals on it. Then they pitched a tent there and kept watch. 9 Early in the morning, as the Sabbath dawned, there came a large crowd from Jerusalem and the surrounding areas to see the sealed tomb. 2 But during the night before the Lord’s day dawned, as the soldiers were keeping guard two by two in every watch, there came a great sound in the sky, 3 and they saw the heavens opened and two men descend shining with a great light, and they drew near to the tomb. 4 The stone which had been set on the door rolled away by itself and moved to one side, and the tomb was opened and both of the young men went in. 10 Now when these soldiers saw that, they woke up the centurion and the elders (for they also were there keeping watch). Both Roman guards and Jewish guards are clearly and explicitly in view. 6. Matthew uses several words to refer to the guards: custodios, stratiotas, and tarountes (‘the watch.’) ‘Straiotas’ translates simply as ‘soldiers.’ It appears in this context in Matthew 28:12 where we read that the chief priests and elders gave a large sum of money to the ‘stratiotas’, or soldiers. It is this very same word that Matthew uses in Matthew 27:27, where we read that “the soldiers of the governor took Jesus into the Praetorium” (in order to beat him to a pulp). While we are told that Herod had soldiers, (Luke 23:11 and Acts 12:4-18) the chief priests, elders and Pharisees are never described as having ‘soldiers.’ They, instead, have ‘officers,’ a point we will return to later. The other three Gospels each use this word, ‘straiotas,’ in reference to soldiers serving under the direct command of Pilate: Mark 15:16, Luke 23:36, and John 19:2, 23-34. The simplest inference is that when Matthew uses the word, he is thinking of it in exactly the same terms as we see it used in the other three Gospels, and indeed, how he used it himself in his own account: 8:9 and 27:27. The clear implication is that Matthew is referring to Roman guards dispatched by Pilate, and the extra-biblical books make what is implicit in Matthew explicit in their accounts. The same texts imply, or explicitly state, that Jewish guards were present as well. The Gospel of Peter is explicit, while the Report of Pilate is implicit. In Matthew, after Jesus’ body disappears, they do not report to their own superiors, but to the chief priests. This implies some kind of working relationship between the guards and the Jews that prompts them to reasonably hope that their fates will be better if they turn to the Jews, rather than their own; inferring the existence of Jewish guards bridges this nicely. Here, then, are four different sources attesting to the presence of Roman guards at the tomb, and moreover many others besides (16 or more guards, the elders, etc). As there was no love lost between the Jews and early Christians, if Jewish temple guards were the one referred to in Matthew, the early Christians would have no qualms in mentioning this fact in their later writings. The early consensus is that Pilate dispatched his own guards, and the Jews had their own people present, too. Having both Jewish and Roman guards on scene provides us with yet another layer of credibility to the account, because the two groups were not exactly on great terms. After all, the Romans are present as occupiers, and the Jews are deeply resentful of that fact. Fortunately, the value we get from looking at the nature of the training of the guards resides almost wholly on the folks more conclusively documented to be present, the Romans. So that, even if we don’t accept that the Jews are also guarding the tomb, we still have many reasons to believe the Romans would have done a fine job–which is precisely why the resurrection account is so historically robust. However, we will probe the relationship between the Romans and the Jews a little more deeply to better understand why it is unlikely the Jews would have left the matter to the Romans to handle alone. But first, let’s talk about Roman training and discipline. 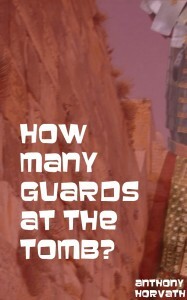 The Temple Guard had been assigned to follow Jesus and report on the teachings and miracles. One could well imagine the locker room stories about healed cripples, blind, dead…multiple people fed from a few loaves and fish. They would have seen the ear replaced and healed when Judas kisses and turns over Jesus. The Disciples were in doubt, Jesus dead and buried. If Temple Guard see the stone rolled away,ml owing what they have witnessed …Jesus rise from the grave, we no longer have Jewish Temple Guards, we have the first Christians.